Not all of our customers have fork-lift trucks or handling equipment so our tail lifts make life easier for our clients. Not all our customers have the facility to mange bulky or heavy deliveries. Thankfully, PC Howard Ltd recognises that this promotes a potential problem to certain customers which is why we have a large number of vehicles in our fleet with tail-lifts. As long as the palletised goods do not exceed 1000 kg's we can easily accommodate you. We can simply move your goods using a pallet truck which is carried on the vehicle and can wheel your goods to their location. 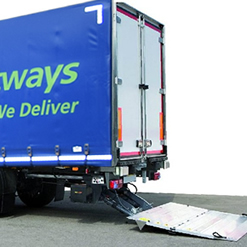 Using tail-lifts will allow you to easily and quickly remove your goods from our vehicles. The hydraulic lift drops your consignment to the ground which can then be taken away with a pallet truck. No manual lifting is therefore required. It is also an ideal solution where access is limited. We realise it is not always possible for our customers to have lifting equipment on site when we deliver so we are able to do all the heavy work for you. If you have special requirements, please let us know when you book a delivery and we will ensure that we accomodate your requirements. Not all our vehicles carry tail lifts so it is important to check with us at the point oif booking to ensure that your delivery requirements are met.